Dental implants have been used successfully for over 40 years, with the first published landmark research documenting the successful osseointegration of titanium implants in (1969). 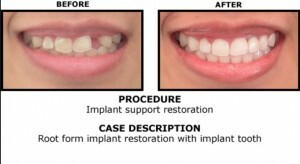 Implants are considered the treatment of choice for the replacement one or more missing teeth. The implant is made up of titanium fixtures that are inserted into the jaw bone and used to replace the missing tooth. Then a crown will be screwed into the implant to replace the crown of the tooth. Dental implants serve many purposes including improved chewing ability and aesthetic. The implant should be in harmony with the mouth and adjacent teeth, therefore accurate diagnosis and treatment planning prior to placement of the implants is mandatory to establish the best position of the implant in the jaw. At Sydney Cosmetic Specialists our specialist’s prosthodontist will perform the required diagnostic steps and discuss with you your existing condition and the possible treatment options to ensure you enjoy a successful long term outcome and a beautiful smile.